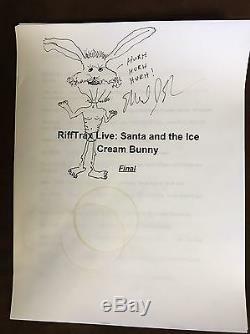 Autographed script from the Rifftrax Santa and the Ice Cream Bunny RiffTrax Live show. With comments by Mike Nelson and cover page has Mike's autograph and doodle of Ice Cream Bunny! 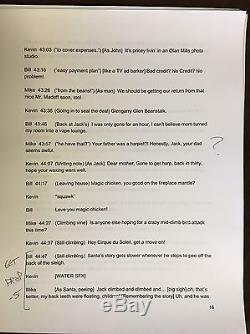 This is the original actual script, not a copy. It even has Mike's actual real coffee cup rings! 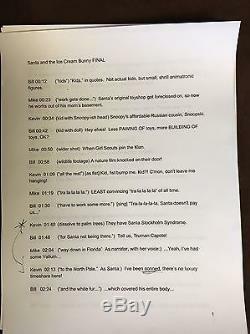 The item "Rifftrax Live Santa & Ice Cream Bunny Autographed Mike Nelson Rehearsal Script" is in sale since Sunday, January 08, 2017. This item is in the category "Entertainment Memorabilia\Movie Memorabilia\Scripts\Originals\Signed". 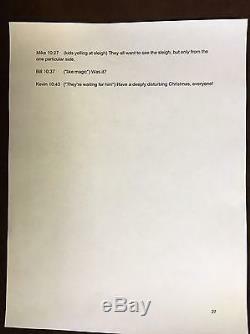 The seller is "mercyisland" and is located in San Diego, California. This item can be shipped to United States, to Canada, to United Kingdom, DK, RO, SK, BG, CZ, FI, HU, LV, LT, MT, EE, to Australia, GR, PT, CY, SI, to Japan, to China, SE, KR, ID, to Taiwan, ZA, TH, to Belgium, to France, to Hong Kong, to Ireland, to Netherlands, PL, to Spain, to Italy, to Germany, to Austria, RU, IL, to Mexico, to New Zealand, SG, to Switzerland, NO, SA, AE, QA, KW, BH, HR, MY, BR, CL, CO, CR, DO, PA, TT, GT, SV, HN, JM.